Wouldn’t you benefit from daily reminders of how to achieve your goals? In the Science of Success, Napoleon Hill taught fundamental principles of successful living. If you’ve read his master works, Think and Grow Rich and Law of Success, you’re already acquainted with the 17 Principles of Success. 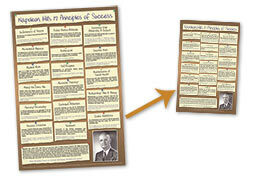 Wouldn’t it be great to have the philosophy of success distilled into one easy to read Napoleon Hill poster? 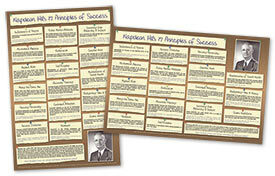 The only Napoleon Hill Poster available that’s approved by the Napoleon Hill Foundation. Now, for the first time, you can put all 17 of Dr. Hill’s principles on your wall where you’ll see it time and again throughout the day. The titles of the principles are large enough to read from a distance and can offer a nudge of encouragement when you need it … or resonate with you in a moment of triumph and satisfaction. Also, at the bottom of the poster is a handsome studio portrait of Dr. Hill, wearing a look of calm confidence that you will want to emulate. A brief biography of Napoleon Hill’s life, work, and philosophy is also presented — an ideal way to introduce newcomers to the timeless principles of success. Click here to view the poster in a larger window. 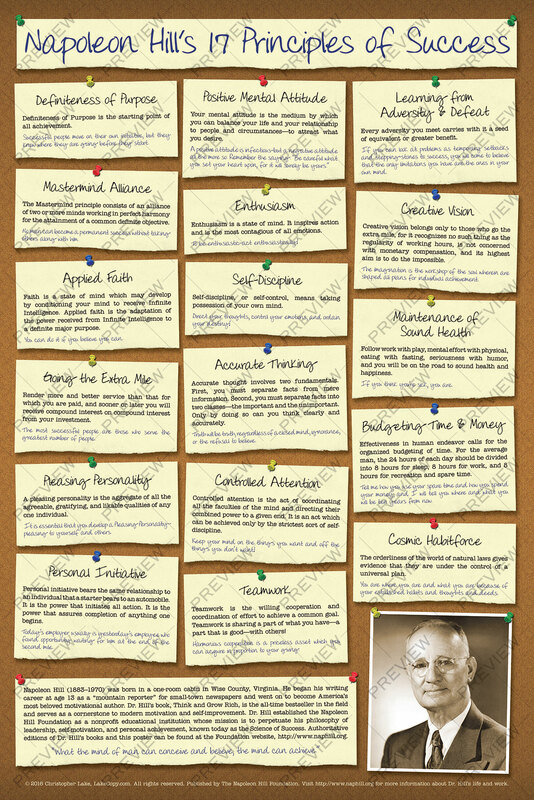 You can own your own copy of the 17 Principles of Success Poster for only $19.97! This poster measures 24 by 36 inches, a standard size which fits a wide assortment of frames available at many big-box retailers and home stores. No need for expensive custom framing! Don’t want a frame? Don’t worry — the poster is printed on sturdy 100-pound semi-gloss stock, so it can easily be tacked directly to the wall or a bulletin board, for example in a dorm room or classroom. 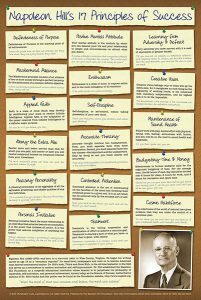 You’ll also be glad to know the 17 Principles of Success Poster is authorized and approved for sale by the Napoleon Hill Foundation. Product options to suit all kinds of wall spaces! One side in portrait orientation, the other in landscape orientation. Choose the side that fits your space! The same great content as the Dual Layer 24×36 inch poster, now in a compact 11-inch by 17-inch size! Order your poster now, and if you’re not satisfied, you’re protected by our unconditional 30-day guarantee. You can return the poster for a refund, no questions asked. But we’re confident you’re going to love your poster and keep it hung proudly in a place where you’ll see it often. We’ll even go out on a limb and suggest you’re likely to come back and buy copies for family and friends. What better way to spread the philosophy of success and surround yourself with positivity! 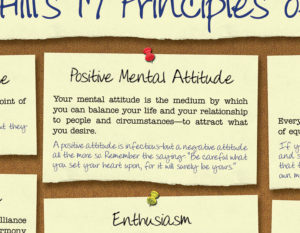 Buy Your 17 Principles of Success Poster Now!